Chuck and Dee Robinson moved to Bellingham in 1980, having left their Illinois home and careers in education to explore the country. They traveled via motor home, sussing out the perfect spot to start the next chapter of their lives. Anyone familiar with Whatcom County knows they landed in Fairhaven and created Village Books, now one of the country’s most beloved independent bookstores. 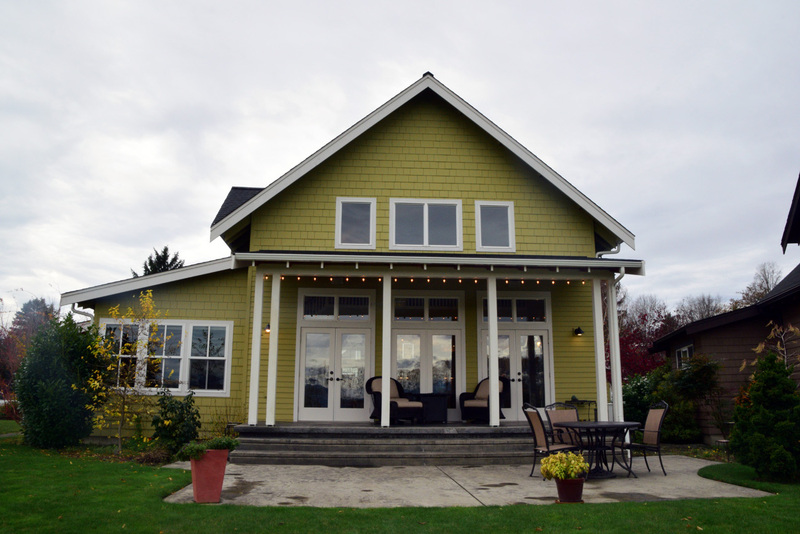 Two years later, they opened Paper Dreams, and a second store in downtown Lynden in late 2015. 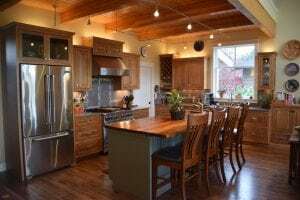 Chuck and Dee Robinson moved to Lynden in June 2015 after living in Bellingham for more than 30 years. Photo credit: Stacee Sledge. 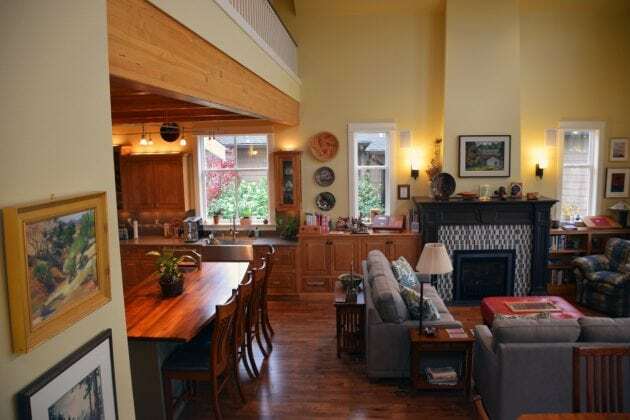 Chuck and Dee lived in a condo they designed above the Fairhaven store from 2004 until earlier this year, when they happened upon the perfect next home – in Lynden. 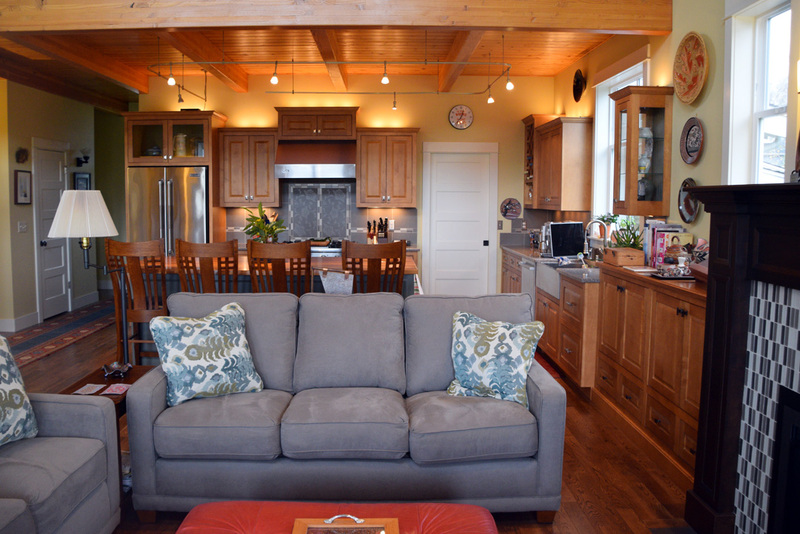 (You can read WhatcomTalk’s feature about their Fairhaven condo here). On top of feeling like it might be the right time to move, it was also a smart economic decision. “This house, even though it wasn’t inexpensive, would cost a whole lot more in Bellingham,” says Chuck. “And it was a lot less expensive than we could sell our condo for,” adds Dee. The home, built in 2009, was previously lived in, but the couple loved the finishes and made almost no changes before moving in. Photo credit: Stacee Sledge. 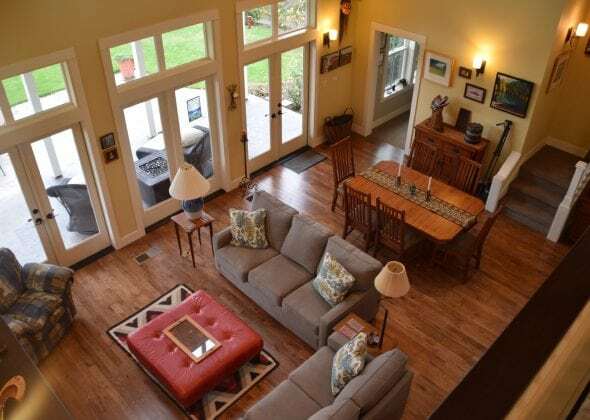 The new home is 3,500 square feet, more than twice as large as their condo. “We tell a lot of our friends, ‘Wait, did we misunderstand and you’re not supposed to upsize when you get older?’” Chuck says with a laugh. 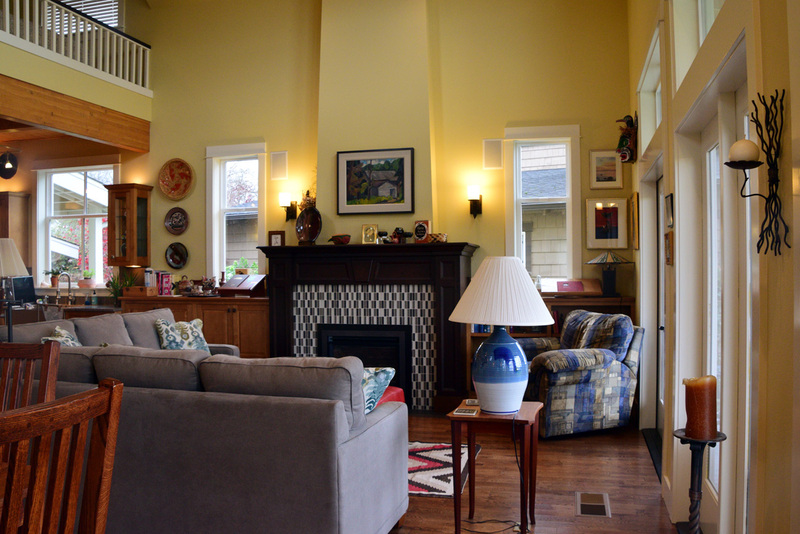 “Also, we simply looked at this house and fell in love,” Dee adds. They moved in late June. 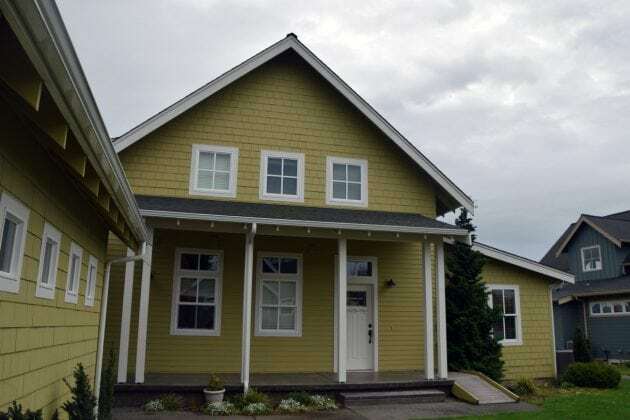 They’ve fallen hard for the neighborhood, as well; a cluster of 10 homes built between 2004 and 2009 on a private road just one block off of Front Street. 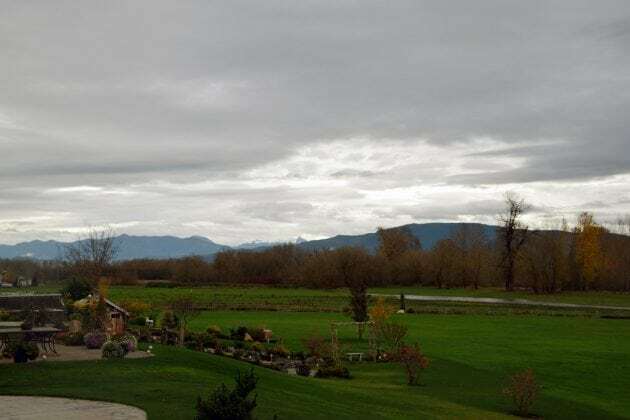 The pastoral scene outside the back of the house gives a peek of the Nooksack River and includes grazing cows and a horse, as well as magnificent Mount Baker views. The first-floor master bedroom, seen here from the kitchen, was a big selling point for the couple, who wanted to have an option for one-story living as they grow older. Photo credit: Stacee Sledge. The couple knew their neighbor on one side, Ron Polinder, before moving in. After dropping Ron home after a meeting they’d both attended, Chuck spied the for sale sign. 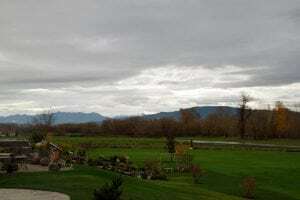 The couple had been thinking about a move since early spring, and were exploring Lynden with help from longtime friends and realtors Bliss and Dan Goldstein. “We didn’t think we were in any hurry,” says Dee. And then Chuck found the soon-to-be-theirs home. 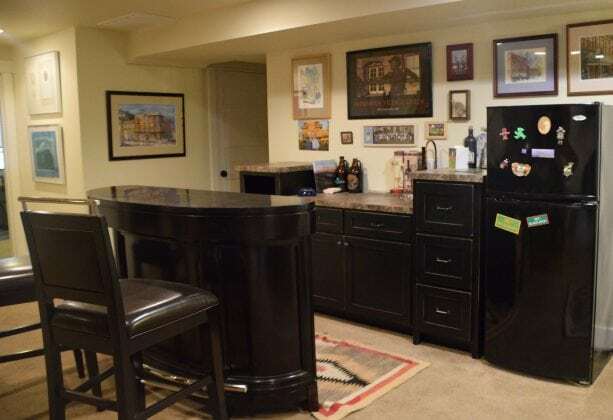 The Fairhaven condo sold in just two days, with an open house so jam-packed they had to station Dan at the door to control foot traffic. 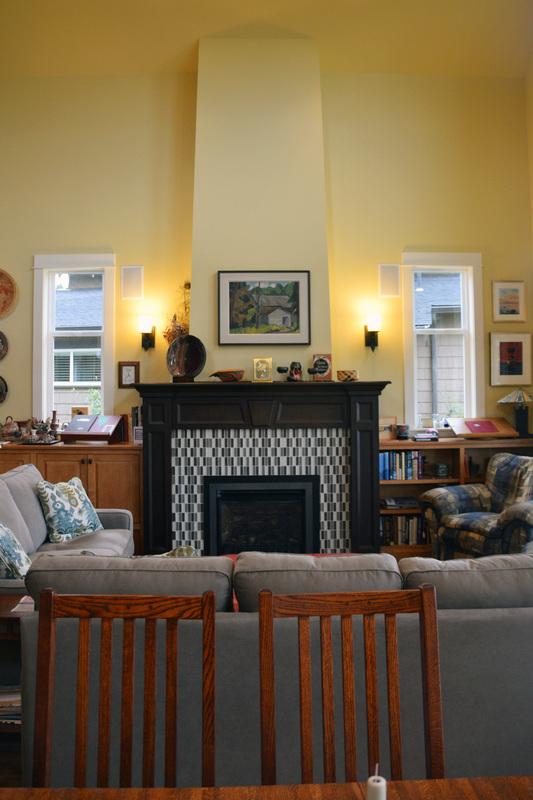 The couple has no regrets about the move and still spends plenty of time in Fairhaven and Bellingham. But now Lynden is home. On clear days, a view of Mount Baker looms on the horizon outside the couple’s great room windows. Photo credit: Stacee Sledge. The artist’s day job was as a colorist and she had been hired to select the paint colors throughout the home. Chuck stops to tell another story on the stairs: “All of these paintings and prints are by Susan Bennerstrom. When Dee posted a picture online, Susan said, ‘I like my corner of your house.’” They both laugh. Upstairs is a guest bedroom, bathroom, and lofted landing area that overlooks the great room below. 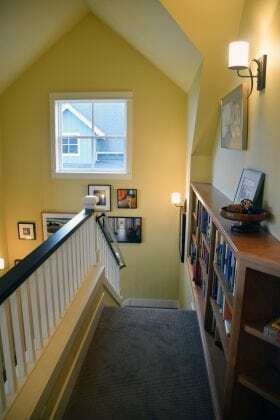 Half-height built-in bookshelves curve around a wall at the top of the stairs. 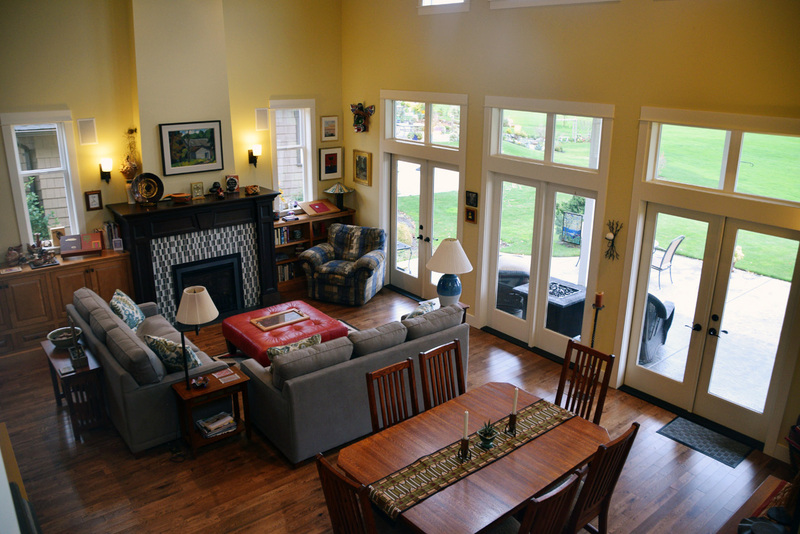 One can stand in the loft and look across the open great room through the windows above the French doors leading outside. “Right here is one of the best views of Mount Baker when there aren’t clouds,” Chuck says. A loft area upstairs includes a guest room and bath, as well as a casual seating area. Photo credit: Stacee Sledge. Back downstairs, Dee shows me her cozy office, tucked off of the dining area of the great room, with a built-in desk along the back wall. A comfortable chair with a book and blanket resting on its arm faces a bank of windows. A hummingbird feeder hangs outside where Dee keeps tabs on a frequent flying visitor. “He just went by,” Chuck exclaims. Two soft, overstuffed gray couches – purchased from Samuel’s Furniture after the move – sit in front of the fireplace and its dark wood mantel and surround of black, gray and white tiles. 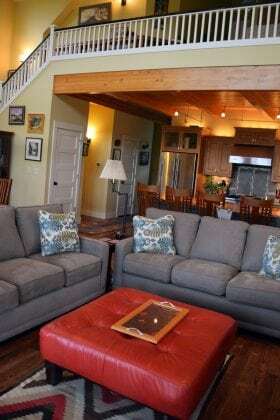 An oversized red leather ottoman stands in as coffee table, a house-warming gift from friends. 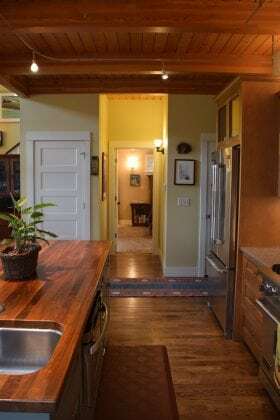 Exposed wooden beams cross high above the vaulted two-story room, which is open to the kitchen, where the same honey-toned wood comprises a lowered ceiling of planks and beams. The countertops are stone, while the oversize island is topped in rich wood. The couple’s Frank Lloyd Wright-style dining set, which worked perfectly in their previous home, is equally wonderful here, melding with the similar fashion of kitchen cabinetry. “It’s a style we’ve always liked,” says Chuck. The home includes a magnificent view of Mount Baker. Photo credit: Stacee Sledge. 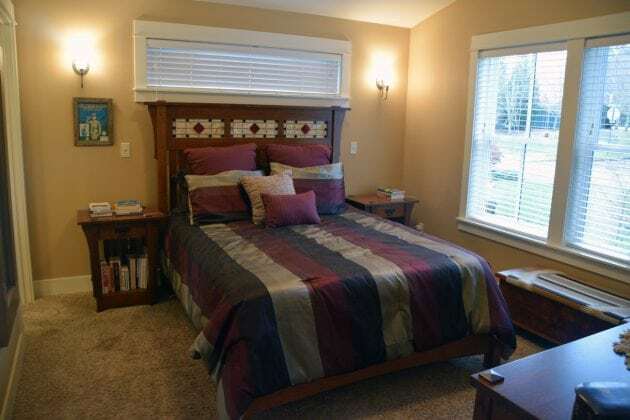 The master bedroom, just steps from the kitchen, holds the couple’s favorite new piece, a prairie-style headboard and bed frame, also from Samuel’s. 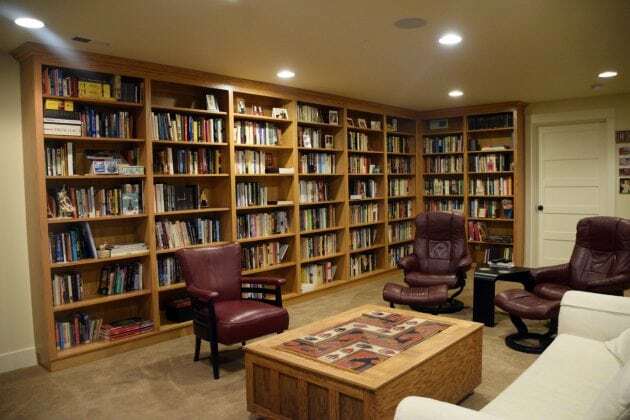 We make our way down to the finished basement, greeted by an expanse of beautiful built-in bookcases in the large, open family room. The couple hired John Blethen’s New Whatcom Interiors, creator of all the cabinetry in their Fairhaven condo, to fashion them. “He does fantastic work,” Chuck says. On the opposite wall from the bookshelves is a substantial cabinetry piece left by the previous owner, which Chuck and Dee added to with a bar and high stools. 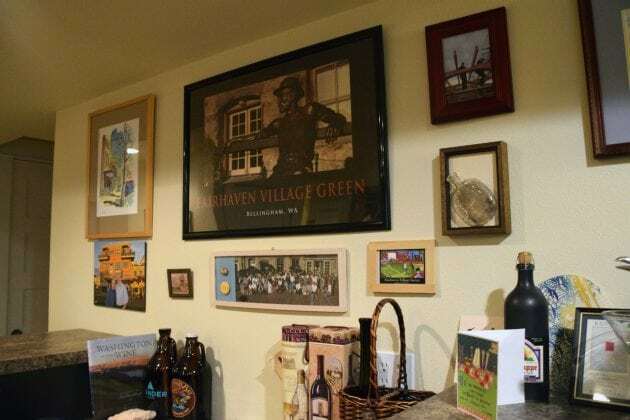 The wall above this area shows off what Chuck dubs their “tribute to Fairhaven,” with framed photographs and artwork related to the neighborhood. A basement bedroom has been converted into Chuck’s office, its walls lined with more photographs. “We have a lot more memorabilia up than we did in the condo because we have more space,” says Dee. 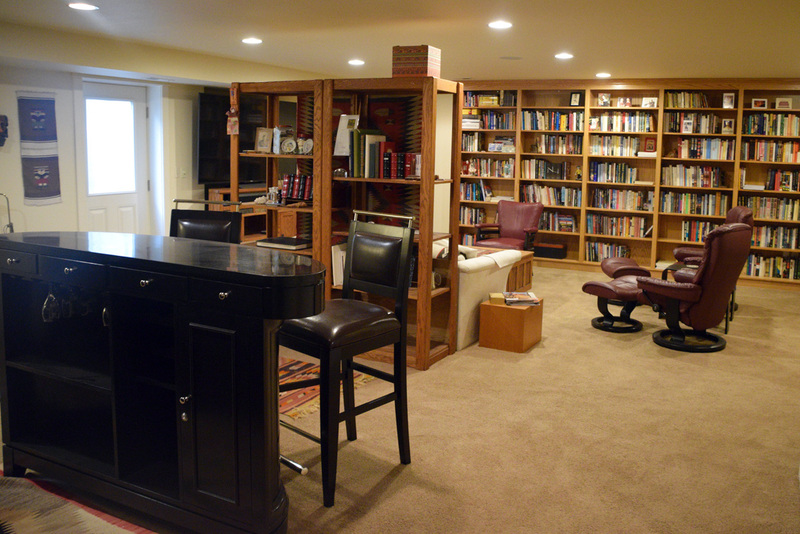 Chuck and Dee Robinson added high stools to this room flanked by bookshelves. Photo credit: Stacee Sledge. “When we moved out here I got myself this desk, which I dearly love,” Chuck says, pushing a button. The desk quietly rises to standing height. Storage space abounds downstairs, with one area that was never converted into a bedroom now doing double duty as storeroom and exercise space. With no television on the other floors, the couple often enjoys the family room at the end of the day, streaming shows and watching movies. They also love their new outdoor spaces. 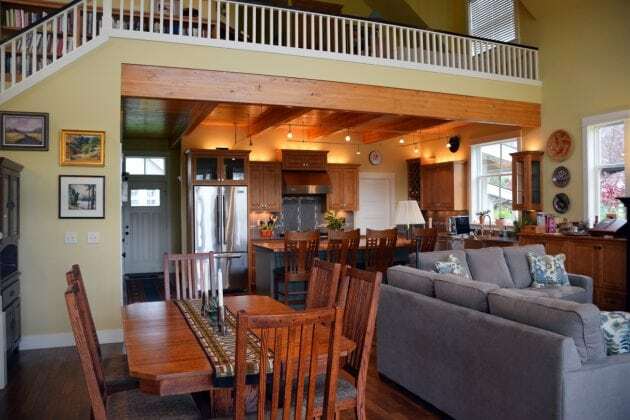 A covered area between the garage and house includes a grill and outdoor dining table. “It’s nice and sheltered, so you can use it year-round,” says Chuck. The Robinson’s welcome visitors to the outdoor space at their Lynden home. Photo credit: Stacee Sledge. The covered back porch, off the great room, can be used nearly year-round as well, though it’s ideally situated for sweltering summer days. Pointing primarily east toward Mount Baker, it’s shaded in those long afternoons and evenings. 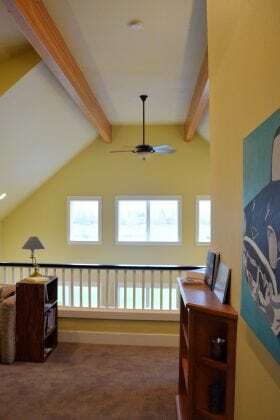 “Our deck in Fairhaven faced west and you felt pretty exposed to the world up there,” says Chuck of the wrap-around condo balcony that overlooked the village green. The couple has felt incredibly welcomed into their new community. “The people up here are so nice,” says Dee. Chcuk and Dee Robinson feel very welcomed by the Lynden community. Photo credit: Stacee Sledge. They already have several favorite spots, from The Mill and Drizzle to the Jansen Art Center and Claire vg Thomas Theatre. But there’s little traffic, he contends. It takes only five minutes more to get to Whatcom Community College from their new home, and if there’s traffic at all in the Bellingham corridor, the Lynden trip is quicker. Settling into their new home, Chuck and Dee Robinson say they didn’t move ‘away’ from anything but rather ‘to’ something. Photo credit: Stacee Sledge. 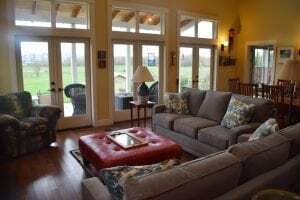 Several months into their new lives as Lyndenites, the couple still gets asked why they moved. Many assume they left Fairhaven for a specific reason: noise, crowdedness, or some other perceived negative change. 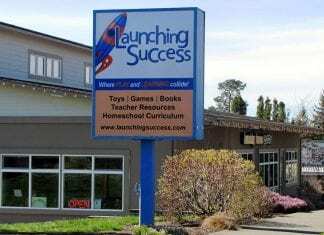 Learn how Village Books came to be at WhatcomTalk, and more about the stores’ new owners here. The Robinson's welcome visitors to the outdoor space at their Lynden home. Photo credit: Stacee Sledge. Settling into their new home, Chuck and Dee Robinson say they didn't move 'away' from anything but rather 'to' something. Photo credit: Stacee Sledge. 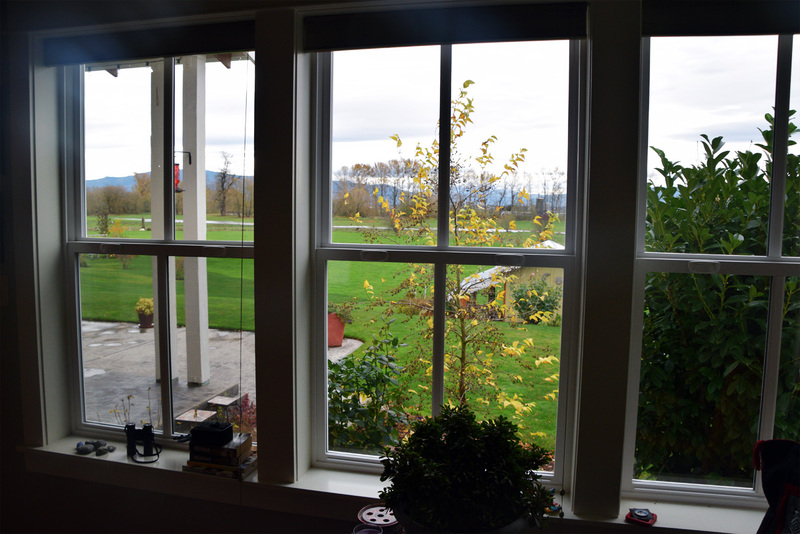 On clear days, a view of Mount Baker looms on the horizon outside the couple's great room windows. Photo credit: Stacee Sledge.